A Makeup & Beauty Blog – Lipglossiping » Blog Archive Christmas Gift Guide-a-palooza: Many for men! Buying presents for men should come with a health warning. How difficult do they make it? I don’t know about yours… but mine isn’t hugely materialistic, which means that he only really has use for super expensive technology, or the boring basics (socks, pants, that kind of thing). This usually results in me over-spending on mid-range crap with a novelty twist in an attempt to raise a genuine smile out of him on Christmas morning. I’m making him sound like the Christmas grinch, which is totally unfair, he’d never let on that he thought my presents were crap, he wouldn’t need to… I already know. Having said that, there is one chink of hope in this toiletry-free zone. Fragrance. And even better, we share a similar taste for woody scents with a hint of the oriental (not too much of that mind). Anything that smells resinous, earthy, leathery, a little bit incensey or even herbally and we’re over it like a rash. Thank god for that. Now, seeing as I can’t buy half of the stuff below for my fella, how about you treat yours? Want to put a bit of fire in his belly? Spice things up with Molton Brown’s Black Pepper Gift Set which includes some of the brand’s bestselling male grooming products: 1 x Re-charge Black Pepper Bodywash, 1 x Re-charge Black Pepper EDT, 1 x Re-charge Black Pepper Scrub Bar. Perfect items for men who prefer their toiletries to be fuss-free – there’s nothing fluffy here, just modern, good-smelling MAN things! All men should smell like this. I have nothing else to say because I reviewed it here – other than that £49.30 is a really good price for this scent. Really good. Give the gift of NY chic this Christmas with the Malin + Goetz Essential Kit featuring a range of the brand’s bestselling miniatures for face, body and hair. The kit includes: grapefruit face cleanser, vitamin E face moisturiser, bergamot body cleanser, vitamin b5 body moisturiser, peppermint shampoo and cilantro conditioner. Perfect for travel, the gym and dirty weekends. Who says that it’s only girls who get to have soft skin? Scrub up your fella with Kiehl’s “ultimate man” (whatever that is!) body scrub soap. The bar contains pumice, skin-softening oat bran, and oat kernel meal to help relax fatigued skin and exfoliate the rough areas. Whilst skincare may be an alien concept to some men, others will appreciate the thought that goes into treading the delicate line between careful gift-buying and accidental offensiveness! Been dating a guy for 3 months? Stick to aftershave and remote controlled cars. Been married for 20 years? Let’s face it, you’re gonna need more than dark circle eye treatment. Unite your man’s love for gadgets with your love for beauty and indulge his technological side with the hi-tech skin-cleaning system from Clarisonic. The Mia 2 features two speeds, a timer and a protective travel case for on-the-go sonic cleansing. Kissable lips are soft lips and Jack Black’s lip balms employ some top-quality ingredients to perfect your pucker. Shea Butter, Avocado Oil and Lanolin work together to nourish the delicate skin on your lips whilst the fine, almost-silky fomula coats lips evenly without feeling too heavy. French men are renowned as some of the world’s most expert male groomers and it’s no surprise when you understand the kind of high-quality brands that they would have grown up with in their native country. The L’Occitan Collection from L’Occitane offers an all-in-one bathroom solution featuring some of the brand’s best-selling products. The collection includes: L’Occitan Shower Gel, L’Occitan Shaving Gel, L’Occitan Eau de Toilette, L’Occitan Soap, and L’Occitan After-Shave Balm. Got a nose for a great gift? 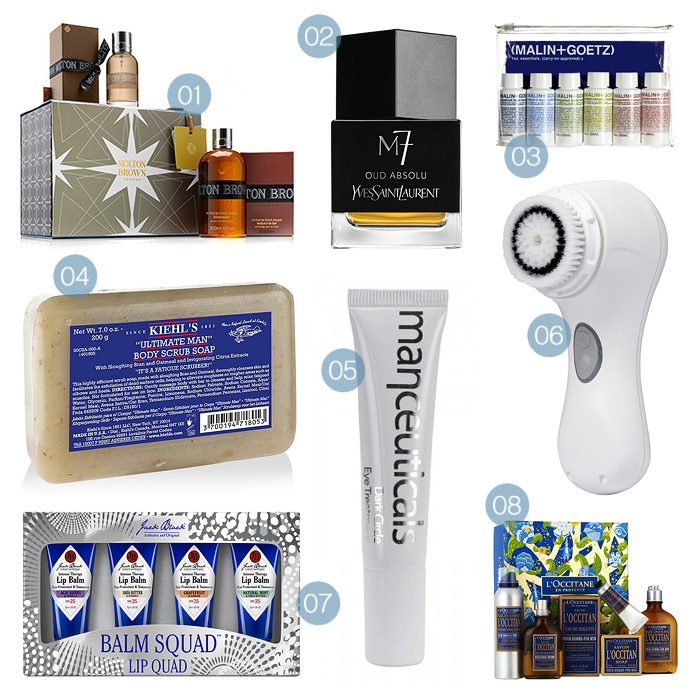 Tomorrow’s scentsational gift guide will keep you heading in the right direction! Oooh I will have to go have a look at L’Occitane for men. The packaging is so nice.